WASHINGTON (Reuters) - A woman who had anonymously accused President Donald Trump's U.S. Supreme Court nominee, Brett Kavanaugh, of sexual misconduct in the early 1980s went public on Sunday, prompting Republicans to plan further discussions about his nomination before a committee vote this week. In an interview with the Washington Post, Christine Blasey Ford, a professor in California, said that as a high school student in suburban Maryland decades earlier, a "stumbling drunk" Kavanaugh pinned her to a bed, groped her and attempted to remove her clothing. She said that when she tried to scream, Kavanaugh put his hand over her mouth. "I thought he might inadvertently kill me," Ford told the newspaper, adding: "He was trying to attack me and remove my clothing." 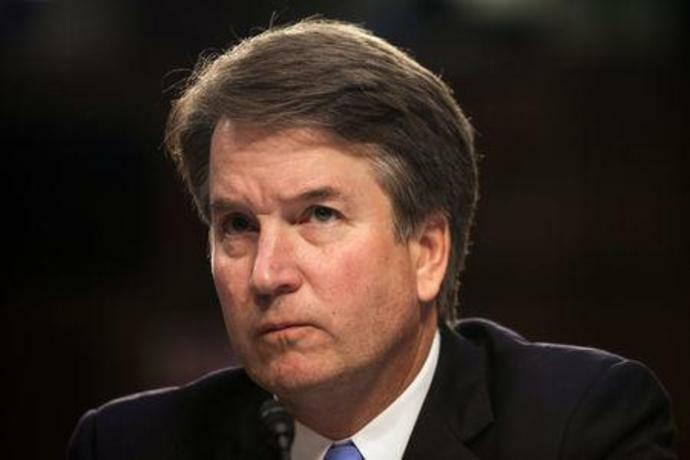 Last week, Kavanaugh, the Republican president's second nominee for a lifetime appointment to the nation's highest court, said he "categorically and unequivocally" denied the allegations. Senate Judiciary Committee spokesman Taylor Foy said Senator Chuck Grassley, the panel's chairman, was working to set up follow-up calls with Kavanaugh and Ford before the committee's scheduled vote on Kavanaugh on Thursday, given the disclosure of Ford's identity and "the late addendum to the background file." Since Trump's fellow Republicans control a slim 51-49 majority in the Senate, and with Vice President Mike Pence to break a tie, Democrats cannot stop Kavanaugh's appointment unless some Republicans make a rare decision to break with their party and vote against Trump. Some said they would like Ford to be given a chance to tell her story. Senator Jeff Flake, a Republican member of the Judiciary Committee, told the Post on Sunday that Ford "must be heard" and urged the panel not to vote on Kavanaugh's nomination until it can hear from her. Another committee Republican, Senator Lindsey Graham, said he "would gladly" hear from Ford if she wanted to appear before the panel, but it would have to be done quickly. The Judiciary Committee has completed its hearings on Kavanaugh and plans to vote on Thursday on his nomination. A positive vote would send the matter to the full Senate. Republicans have just an 11-10 majority on the committee, so Flake's vote could make a difference. While it would be unusual, the committee is not required, however, to approve Kavanaugh before the full Senate votes. Two moderate Republican female senators who support abortion rights and are not on the Judiciary Committee, Susan Collins and Lisa Murkowski, have been under particular pressure not to back Kavanaugh, who is seen as a social conservative and if confirmed, is considered likely to tilt the top U.S. court even further to the right. Neither responded to Reuters' request for comment, but Collins told CNN on Sunday that she would be talking with her colleagues. She said she had spoken to Kavanaugh about the matter on the phone and he was emphatic in his denial. The committee, and the Senate's Republican leaders, have so far kept to their plan to confirm Kavanaugh quickly. "It's disturbing that these uncorroborated allegations from more than 35 years ago, during high school, would surface on the eve of a committee vote," Foy said. Senator Diane Feinstein, the top Judiciary Committee Democrat, called for a delay, saying the FBI should conduct an investigation before the Senate moves forward on the nominee. Republican Senate Majority Leader Mitch McConnell has said he would like to have Kavanaugh confirmed by Oct. 1, the start of the Supreme Court's new term. Ford, now a 51-year-old research psychologist in California, told the Washington Post that she sent a letter in July to Democratic U.S. Representative Anna Eshoo about the incident but requested confidentiality at the time. The existence of the letter and some details of its contents became public in recent days.